Between 2006 and 2009 Indonesia was the world's hot spot for H5N1 avian flu, before eventually ceding that unenviable distinction to Egypt in 2010. Since the start of 2015, Indonesia has only reported 2 cases, while Egypt has reported 146. As with all countries dealing with avian flu, `reported cases' are assumed to be a small subset of the actual number of human infections, representing only the `sickest of the sick' who are lucky enough to be tested and diagnosed. Despite its reputation for having an extraordinarily high mortality rate (50%+ among hospitalized cases), for more than a decade the debate has raged over just how prevalent `mild' or sub-clinical infections with the H5N1 virus really are. 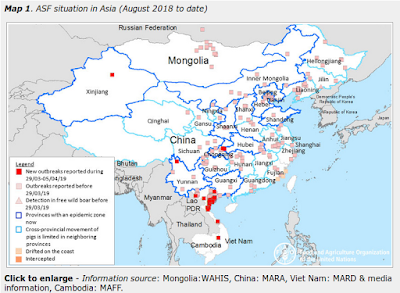 We've seen the same questions posed on H7N9 in China and MERS-CoV in the Middle East, and the question is valid for many other infectious diseases. The best way to the number of people infected by a virus in a population is to conduct regional seroprevalence studies. You essentially check antibody levels against a specific virus in a representative group of the population. Unfortunately, you don’t necessarily end up with a clear cut Infected/Not Infected reading from these tests. You get an antibody titer level, and that requires a subjective decision as to what level constitutes proof of a `previous infection’. Over the years we’ve seen a number of seroprevalence studies conducted on the H5N1 virus, and the results (and methods) have varied considerably. As you might expect, the numbers have gradually gone up the longer the virus has been in circulation. Earlier this year, in EID Journal: H5N1 In Egypt, we saw a report on a seroprevalence study that found antibodies for H5 in roughly 2% of the people tested, suggesting tens of thousands of cases may have gone uncounted in Egypt. Until now, all of the studies we've seen have found seroprevalence rates in the low to middle single digits among those with frequent poultry exposure, and much lower numbers among the general population. All of which makes the high seroprevalence numbers reported by a new study published in the Journal of Infectious Diseases more than a little surprising. Background. In Indonesia, highly pathogenic avian influenza A(H5N1) virus has become endemic in poultry, and has caused sporadic deadly infections in human. Since 2012 we have conducted fixed-point surveillance of avian influenza viruses at a live poultry market in East Java, Indonesia. In this study we examined the seroprevalence of the virus infection among market workers. Methods. Sera were collected from 101 workers in early 2014 and examined for antibody activity against avian A(H5N1) Eurasian lineage virus by hemagglutination inhibition (HI) assay. Results. By the HI assay, 84% of the sera tested positive for antibody activity against the avian virus. Further analysis revealed the average HI titer in 2014 to be 2.9-fold higher than in 2012 and that seroconversion occurred in 44% of paired sera (11/25) between 2012 and 2014. A medical history survey was carried out in 2016; responses to questionnaires indicated that none of workers had suffered from severe acute respiratory illness during 2013. Conclusions. This study provides evidence of a high prevalence of avian A(H5N1) virus infection in 2013 among workers of a live poultry market. However no instances of hospitalizations were reported, we can therefore conclude the virus did not manifest any clinical symptoms in workers. Our study provides seroevidence for the high prevalence of H5N1 influenza virus infection among live poultry market workers in East Java, Indonesia in 2013. Eighty-four% of sera from the workers tested positive for antibody activity against Av154(H5N1 Eur) virus. Medical history questionnaires reported no instances of hospitalization for severe acute respiratory illness during 2013. Although a significant percentage of the workers had suffered from influenza-like illness, it could not be related to the Av154(H5N1 Eur) virus infection. We therefore conclude that the Av154(H5N1 Eur) virus did not cause clinical symptoms in humans, suggesting that the highly pathogenic nature of avian H5N1 influenza viruses was not inherited when transmitted to humans. The Av154(H5N1 Eur) virus used in these tests was isolated from a September 2013 outbreak at a turkey farm in East Java and belongs to clade 2.3.2.1 which appears to have arrived in Indonesia in late 2012. Prior to its arrival, clades 2.1.1, 2.1.2. and 2.1.3 were most commonly reported in Indonesia. As we've discussed previously (see Differences In Virulence Between Closely Related H5N1 Strains), various clades of the H5N1 virus can pose different threats. And within each clade (which are based on the HA gene of the virus) there can be many variants, which again can affect this behavior of the virus. All of which means that we can't necessarily extrapolate these seroprevalence numbers from Indonesia to Egypt or to China - or for that matter - to other clades of the virus. None of which makes these findings any less remarkable. Hopefully we'll see additional studies on a larger and more geographically diverse cohort in Indonesia, to see if these results can be duplicated beyond the vendors of one live bird market in East Java.